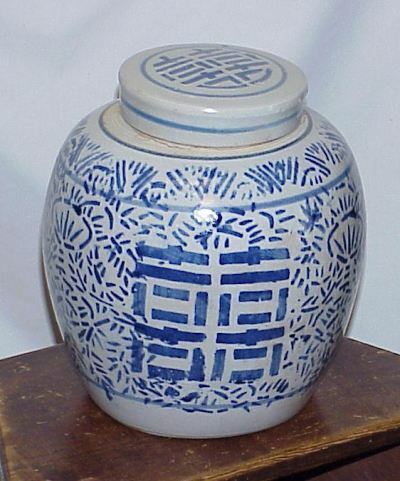 Can you identify this jar? I would appreciate it if you could tell me anything about this jar. I cannot find any info on it. It has no markings anywhere to help identify it. Any help in determining age or value would be greatly appreciated. This Ginger Jar is quite unusual and before I recently visited an old pocelain dealer, just a few blocks away from Hollywood Road in Hong Kong, I had never before seen any of these Jars. Now this old man, who more or less have closed his shop, did have a few of these left at the back of his storage shelves. He told me that most of his stock was some twenty years of age, some older some less so. I did not specifically ask him about these Jars, but I do recognize them and I believe that we could assume that these are from around the cultural revolution or slightly later i.e. from the last decades of the 20th century. As for a value I honestly don't know what to suggest and I forgot to ask ..